Let the Celebration Begin!- cause its all about me! 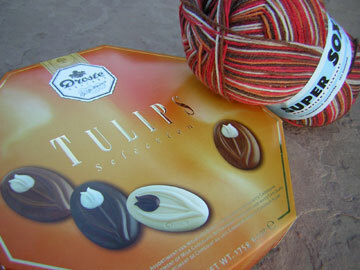 Stephanie was in Europe last week on a biz trip and brought me back the most delectable Chocolates from Holland and skein of yummy sock yarn I can't wait to play with! And of course the Mail Faeries showed up in FULL force at Chez Secrest-- I came home to find the LARGEST record holding "Amy-mail-love" pile of all time (I mean stuff that dreams are made of) I have few things I need to highlight in this pile of LOVE. The cow card on the far left came all the way from Australia. My childhood penpal from England reconnected with me last year after not being in touch for 15 years-- She has just moved with her husband to Perth and this is the first piece of snail mail since the move-- with the most wonderful news they are expecting their first child in late September. I got a wonderful card from my in-laws too! 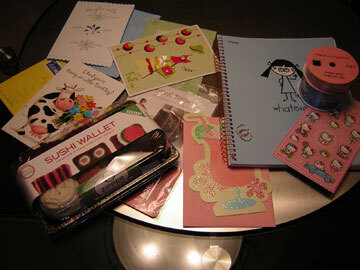 The pile of goodies grouped on the right include the best david and goliath notebook, hello kitty fabric ribbon spools (LOVE IT!) and the most adorable amyville-esque pink sparkly earrings. 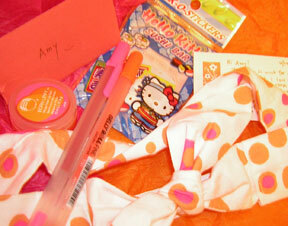 These items are very special to me, as they are from one my dearest childhood friends, also named Amy. Amy and I reconnected back in September last year when she hosted our 15 year high school reunion. Its wonderful to have a history with friend for almost 25 years -- and that we are so close as adults. And lastly the Muszynski clan spoiled me too... - Raquel knows my weakness of SUSHI and I have been eye-ing this kit forever! THANK YOU to all my friends for making me feel so special :) Tomorrow I am taking my cousin Jerri --"Mama Jer" -- (she is the oldest daughter of my recently deceased Auntie) to Dolce spa so we can enjoy our birthday together. I was born on Mama Jer's 33rd birthday-- so it's very special to share a birthday with a close family member. Introductions please.......Blog this is Amy, Amy this is your Blog. Yes my blog has been feeling quite ousted, abandoned, neglected...etc. But at always my blog waits patiently for me to post... and finally here it is! 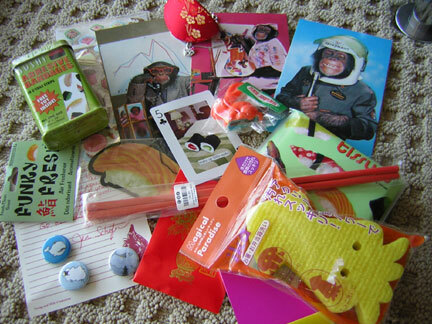 * Caroline and I became penpals in 1986. We wrote constantly and eventually lost touch in the early 90s, during our college years. Earlier this year a surprise letter found it's way to me! We have reconnected and find we have much in common 20 years after the start of our friendship across the pond :) Thanks Caro! Christmas crafting has become a realization for me this week, note the absence of posting as I overspend my crafting time hours! :)I have a feeling it may be a "photo-finish" to complete all my holiday crafts...but I am still in denial. 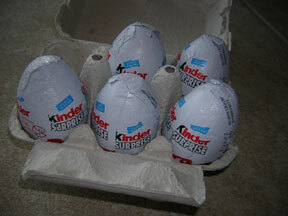 I got a really cool package from Rebecca in France last week-- kinder surprise eggs! 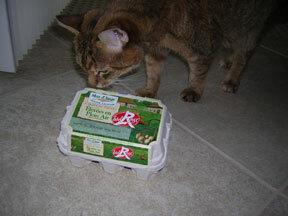 And she is so clever, put them in french egg cartons, Canella had to investigate. I love the toys that come in these eggs-- and the chocolate is quite yummy too! Thanks Rebecca! Artist Friends are the BEST! 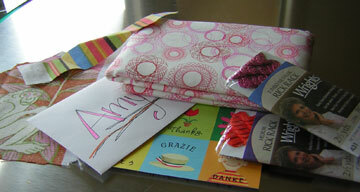 My very good friend, Melanie- from the U.K. sent me a wonderful package. After picking it up from the postal nazis in Gilbert-- I ripped into the package immediately. I was floored. See, Melanie is an incredible artist, you know- one of those folks who can actually do portraits of people sitting in front of her, and she is a web-mistress to boot! 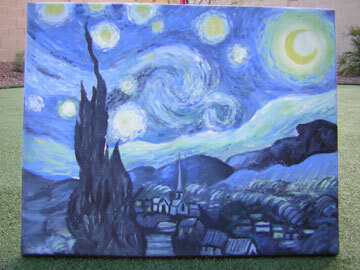 Lookie what she sent me... she painted, for me, one my favorite pieces of all time- Van Gogh's Starry Night. It's beautiful, and this picture doesn't give it justice! THANKS MELANIE!- I LOVE it! 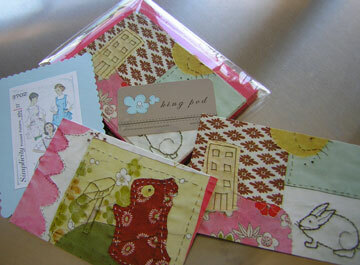 Stacey sent me a little thank you package from her visit to Arizona. 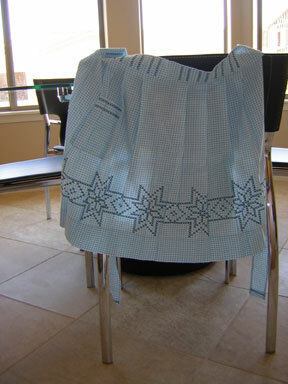 I love that spirograph fabric! :) And glittery rick-rack!! Thanks Stacey! Laurie and I are doing a pin swap... If you haven't checked out her shop...go right now! 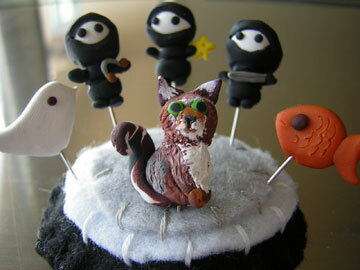 She makes awesome polymer clay items on pins-- she is a clay-goddess! Lookie what she made me... a mini-Canella! 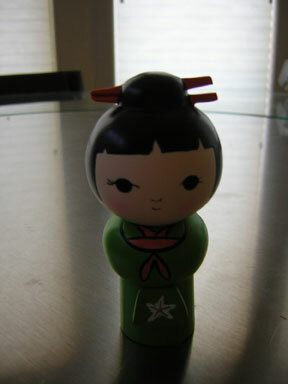 And her ninjas rock too! Thanks Laurie! Isn't surprise mail the best? This was forwarded from our old address to the new place...so it took a little longer to get here! Lookie what Cara of Bead It fame sent me! I am so addicted to stitchmarkers! 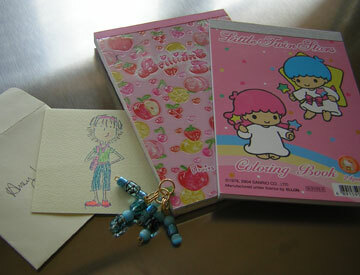 And fun san-x and sanrio notepads too! :) THANKS CARA! Some businesses keep the dollar bill from their first customern sale. Amyville makes friends with her first customer. Rachel was my first customer when Amyville went live last November. And a bit of trivia...she wore a pair of amyville cupcake earrings at her wedding! 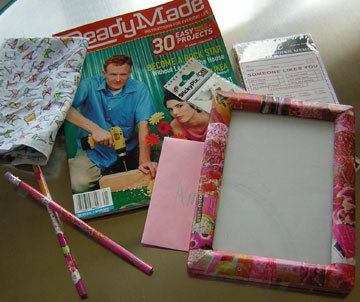 :) We did a crafty swap, and look at the cool decoupage frame she sent me! Pink and Orange of course! 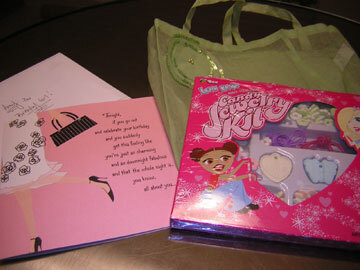 she also sent other goodies too! Thanks Rachel!!!! !